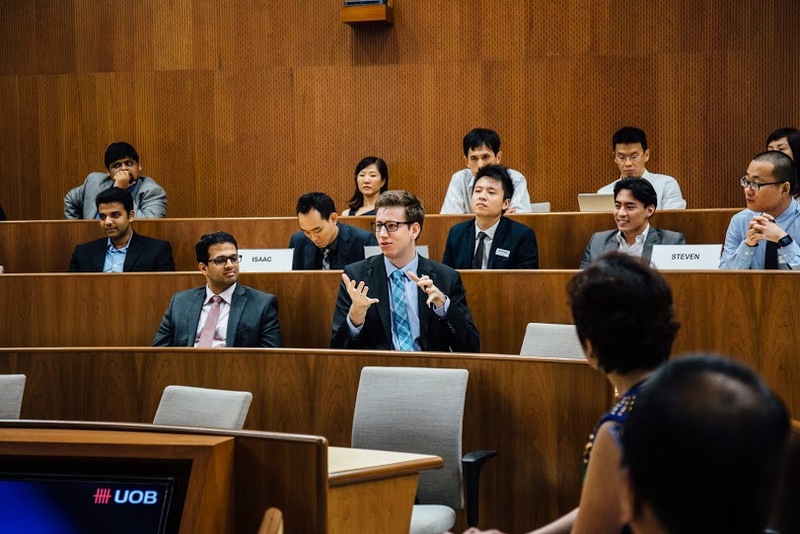 The Invitation to the 4th Alumni Leaders Dialogue with Mr Eric Lian, President and CEO of UOB China, was issued to all current graduate program participants of Nanyang Business School. All seats at the NTU campus venue were taken when Mr Lian spoke about the issues oft he banking business in China and the outlook for the fastest growing economy of the world. With more than 20 years of banking experience in business and risk management, Mr Eric Lian joined UOB in July 2013 and was appointed President and CEO of UOB (China) shortly thereafter. He is also member of the Bank’s Executive Committee. 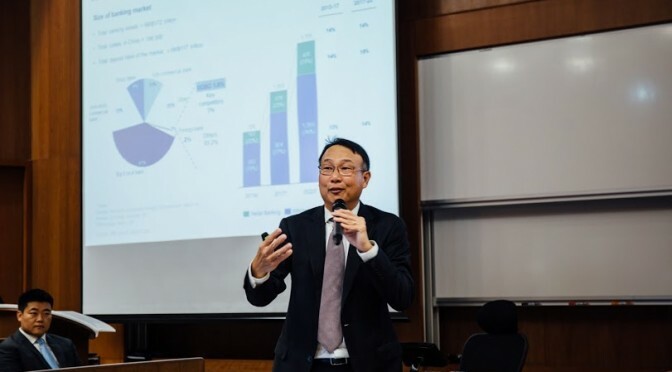 During the December session of the Alumni Leaders Dialogue series, Mr Lian provided an operator´s view on the banking business in China and helped the present audience understand the status quo of the Chinese economy and outlined his view on the development plans of China´s government. During his address, the veteran banker shared his expert opinion on the China Banking Landscape, sketched the “One Belt, One Road” Initiative and elaborated on Free Trade Zones within China. After pointing out the three main aspects of China´s exceptional growth, he illustrated his personal conclusions on the future of China and derived implications for banks or corporations who wish to do business in China. According to Mr LIan, the internationalization of the Renminbi as the 5th most traded currency worldwide, the tremendous wealth among the people in mainland China, and continuous liberalization of cross-border RMB flows, will be strong growth drivers for the future of China. “We all know that China does not produce millionaires anymore. They produce billionaires”, said Eric Lian. After a long period of government subsidies over the past years, the country has come to be the world´s second largest and fastest growing economy in terms of GDP measures. Spending money in the desired growth sectors, supporting the development of core industry´s competences and intensively driving up demand, China as thee “factory of the world” has accumulated over-capacities, inefficient structures and unsustainable business practices. Now, a painful period of restructuring causes growth figures to slowdown and makes the world hold its breath. However, China government initiatives such as the “One Belt, One Road” policy, that aims to secure resources, develop the Chinese export markets, and prepares new growth paths to offset over-capacities, clearly signal that China still sets the course for growth. 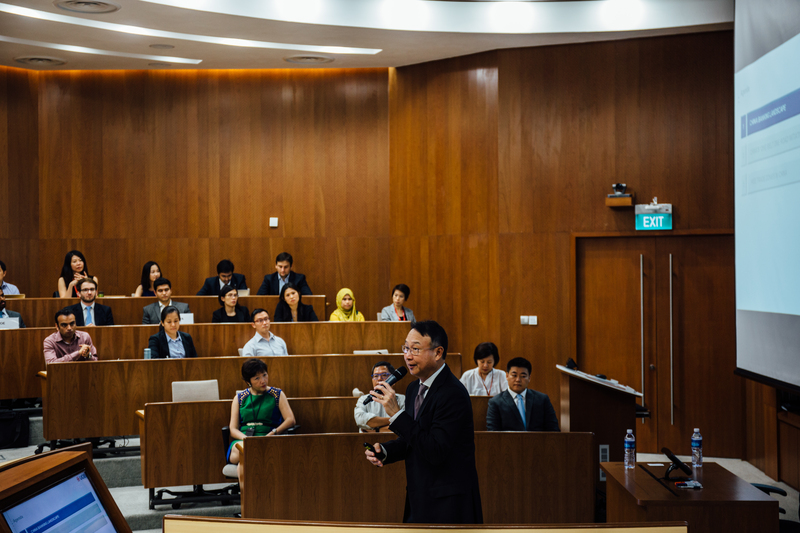 Besides speaking of China Banking in the macroeconomic context, Mr Lian also gave an insightful introduction into Chinese business culture and frankly presented his view of Chinese investment management practices to the attending students. Other than European clients, Chinese middle class clients primarily focus on investing their savings in stocks but at the same time wish to offset the risk resulting from volatility in the stock market by investing in real estate as early as possible. “If you want to get married in China, you need to own a house”, he explained to the diverse group of international students. Thus, the challenges faced when dealing with clients in China are very different from the needs of clients in other parts of the world. 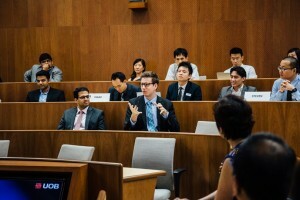 Responding to questions from his attentive audience, the speaker closed his talk by outlining his response to competition from online banks and e-commerce firms. The disruption caused by digital players forces traditional banks to rethink their strategy, adjust their way of working to the digital reality and restructure not only their product portfolio but also their interactions with customers around the world.